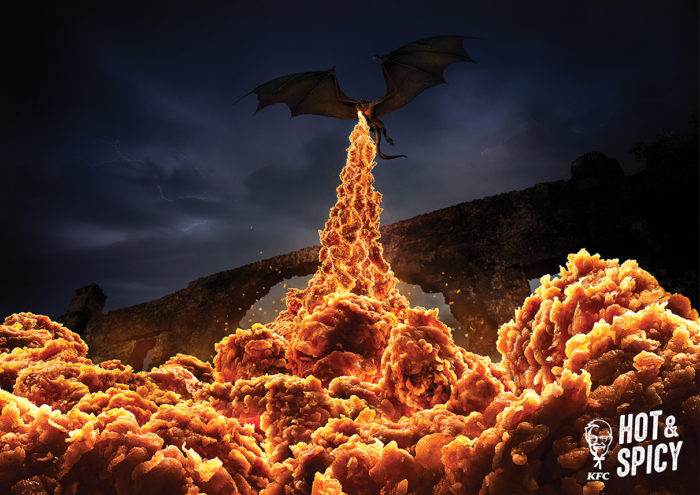 One year on from its critically lauded 2018 campaign featuring explosive visuals of the fried chicken variety, Ogilvy brings back the heat for a refresh of its KFC “Hot & Spicy” concept with a Game of Thrones twist. As with the last iteration of this campaign, Ogilvy has produced imagery that is – at first glance – of massive combustions but is in actuality nothing more than exquisitely photographed pieces of fried chicken. This edition, featuring a terrifying dragon producing the bout of flame, is a cheeky tribute to the upcoming final season of Game of Thrones, due to start this coming Sunday the 14th of April. Launching online, the campaign will be followed by three more executions rolling out in the coming weeks that will appear in print and key outdoor media. “KFC has always been part of the cultural conversation, so the upcoming premiere was the perfect opportunity to remind customers that the best way to enjoy the show is by grabbing a bucket of Hot & Spicy to share” said Shirley Chau, marketing director KFC Hong Kong. The company also introduced CoCo, which stands for "from COntent to COmmerce", to maximise reach on TV and digital. ..